Dodgy At Best: Swindle On Soccer, Vol. 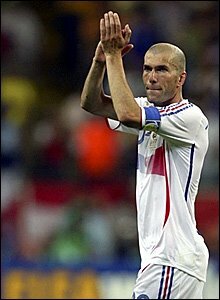 7: Zizou! illustration of elan, the telekinetic Zinedine Zidane. chaos, that image was enough. Six years passed. Zidane became an old man at 34. The rematch, eight years later. adieu, not only to the Cup but to soccer altogether. Ronaldo is clearly in the Elvis phase of his career. on the supernatural from fans and foes alike. passes through the increasingly flustered Brazilians. "Sorry, I can't hear you. Did you say I was past it?" Barthez's outlet balls and hoping for quality chances. penalty rather than fight for possession and the shot. pounds of privilege he carried into Germany. 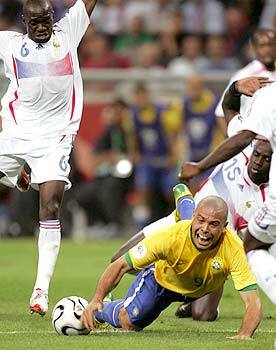 Why didn't he do what he did against Ghana? earned just one more chance before his soccer death. casual eye for the game. Still a giant at 34.
column doesn't come close to delineating. Um, yeah, that pretty much sums up everything I've ever wanted to say. Damn you Orson, damn your briliance. 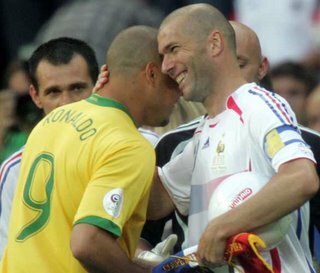 The other interesting thing about ZZ10 and R9 is that they were both signed by Real Madrid, ushering in the "Galatico" era at Real Madrid, and have been teammates for a few years there.